Architectural Product News is a bi-monthly print magazine and digital update of products and services for building industry specifiers. It is an effective alert to new models, trends, colours and finishes. You’ll find the latest architectural, building, interior and landscape products, whether for public, commercial, hospitality, health care, educational or residential applications. You can enquire about the products you like by making a direct enquiry to the supplier, by linking to the supplier’s website and via the easy-to-use reader enquiry system. Each issue of Architectural Product News brings you new products and services and with two issues always online in digital form at ProductNews.com.au there are hundreds of building products to explore. Architectural Product News magazine and its digital version, ProductNews.com.au, are endorsed by the Australian Institute of Architects and the Design Institute of Australia. 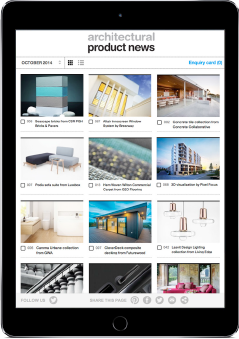 By connecting specifiers and suppliers, Architectural Product News and ProductNews.com.au provide the easy way to keep up to date. You can enquire for more information on individual items or there is a simple enquiry card to make multiple product enquiries in one action. All enquiries go direct to the supplier – with no delay. It is used by architects, building designers, interior architects, interior designers, landscape architects, developers, project managers, facility managers, planners, draftspersons and builders – professional specifiers – those who make decisions about what to specify.